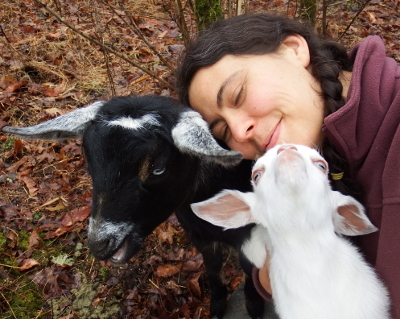 I started getting sick the night before our baby goat was born, so I missed a lot of photo and cuddling opportunities. Luckily, just holding Lambchop up to his mother's teats for the first four days ensured that the kid thinks I'm some kind of mother figure. So I apparently don't have to worry about him being unsocialized. 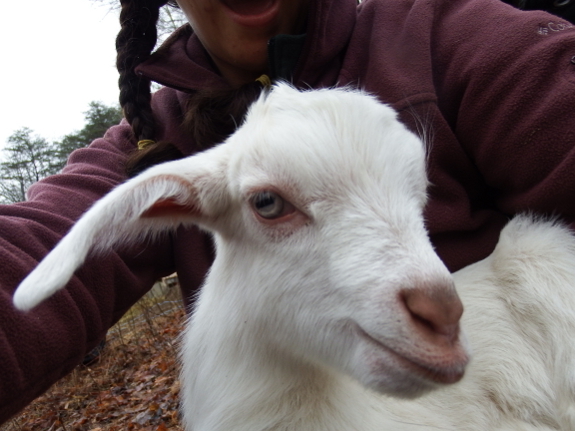 In fact, when I went out into the pasture with Lambchop and Artemesia to give our doeling some much overdue TLC, the kid hopped right up into my lap for extra petting...then jumped down...then jumped back up...then jumped down. I guess I don't need to worry about his early nursing issues impacting his vitality either. Abigail figures that producing milk is a full time job. 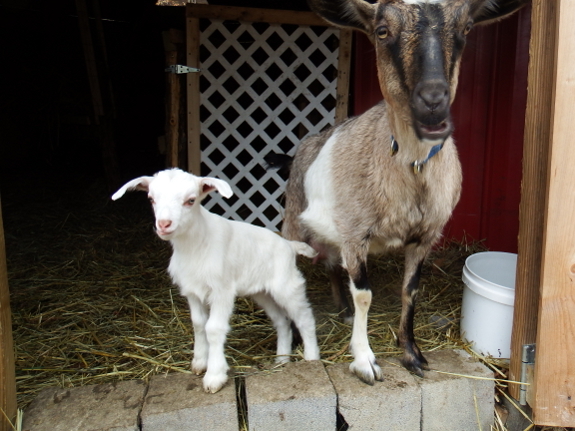 While I rollicked with the younger goats, our doe stood in the doorway of the coop and chewed her cud. Then she took a break to head to the manger for some hay, called Lambchop over to relieve a bit of pressure on her udder, then got back to the all-important work of cud-chewing. She feels no need to rub up against the human. 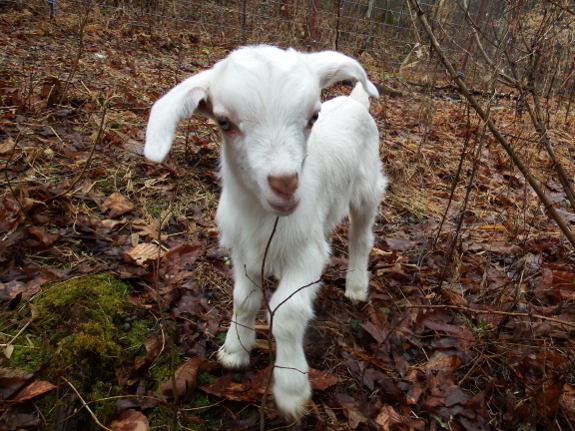 Artemesia, on the other hand, has been a bit attention starved ever since she stopped being the cutest animal on our farm. She's done a good job of turning into a gentle auntie for Lambchop, bouncing around with the kid while Abigail stands sentry in the doorway. But Abigail has continued to act crankily toward her coop-mate, and Artemesia was quick to lean her shoulder against mine and settle down to soak up a little bit of love when it was offered. It's a fine line between socializing a buckling to the point where he'll be easy to handle...and falling in love with him. But I hope that Mark's witty name for our kid will remind us that Lambchop is bound for the freezer. 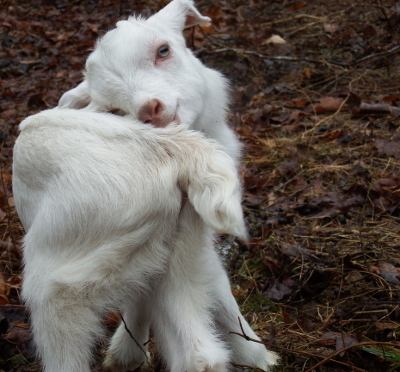 The moniker also reminds me that I left out the biggest reason new homesteaders shouldn't get goats in my previous post --- it's tough not to fall for the bucklings. But the world only needs so many wethered pets, so Lambchop and I will become friends but not confidantes. I'll save my secrets for Artemesia. He IS pretty adorable. As is Artemsia. i look forward to seeing whats going on with them... i cant believe after all that snow you are melted out already! i have a question. I read, somewhere, that one cannot eat a buck.... that unless wethered, the meat is tainted and smells Horrible when cooked. 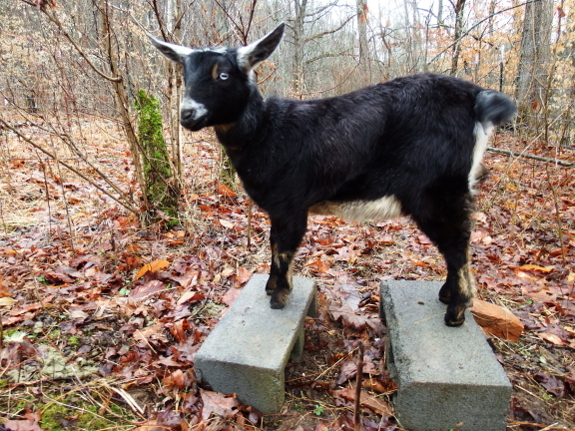 So all you goat experts out there... is there any truth to this?